Copernicus Publications has started an XML-first workflow and will provide new articles in all of its 36 open-access journals in full-text XML from now on. XML (Extensible Markup Language) is the key to preserving today’s scientific findings for the future. 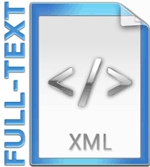 As a standard markup language, XML makes media-neutral data storage possible. It therefore provides the basis for real long-term preservation that is not bound by formats that might soon be outdated. From now on, the primary format at Copernicus Publications will be XML, published under the Creative Commons Attribution 3.0 License. This does not change anything for the authors, but it offers maximum freedom to the reader. Scientists will still submit their manuscripts in TeX or Word, and Copernicus’ typesetters will convert everything into XML, including MathML for structured mathematical content. PDFs will then be produced from the XML and published for each article. As a result of this XML-first workflow, the conversion to new formats is not a problem. Continuing on this new basis, Copernicus’ next step is to publish full-text HTML resulting also from the XML. This improvement is scheduled for spring 2015 and will increase the visibility of scientific papers on the Internet even further. View and download the press release. Visit the first full-text XML D-paper, published in ACP. View the technical instructions for preparing a manuscript for submission in LaTeX.